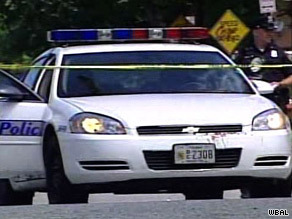 (CNN) -- Two Baltimore, Maryland, police officers were shot Saturday after a gunman's domestic dispute led to shootings at two locations, a police spokesman told CNN. Crime scene tape cordons off a squad car involved in a chase and shootings Saturday in Baltimore. The rampage began at the home of the suspect's ex-girlfriend, who has a restraining order against him, police spokesman Don Moses said. The suspect, 34, forced his way into her home and they argued, Moses said. In an apparent rage, the man fired a round from a 9 mm Ruger, Moses said. The ex-girlfriend called police about 10:30 a.m.
Moses described to CNN what unfolded next. Police have not released the names of anyone involved. Police received a call from the suspect's current girlfriend just before 11 a.m. She told them the suspect came to her home and assaulted her, and she suffered minor injuries. While a 42-year-old policeman was at her home tending to her report, the suspect called her. The officer talked to the suspect on the phone and convinced him to return to west Baltimore, where the girlfriend lived. When the suspect pulled up in a car, the officer approached him and was fired upon, suffering a gunshot wound to the buttocks. The wounded officer got into his patrol car and chased the suspect. An officer providing backup at the first shooting scene spotted the suspect's vehicle parked three blocks away. As the policeman observed the vehicle from inside his patrol car, the suspect appeared on the driver's side and fired at the officer. The backup officer, 44, who was wearing a bullet-proof vest, was shot in the chest and arm but managed to return fire, hitting the suspect three times. He was in stable condition after surgery and was expected to survive. The suspect is in custody and expected to live, Moses said. The officer shot in the buttocks was treated and released from the hospital Saturday.